﻿ 2017 BusinessWorks! 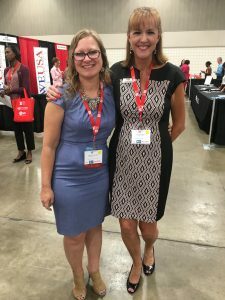 Trade Show :: Guaranteed Express, Inc.
On September 7, 2017, Guaranteed Express joined other WBE’s and Corporate Members in Arlington, TX for the Women’s Business Council Southwest annual BusinessWorks! Expo event. This is a wonderful trade show that features trade show booths filled with WBE and Corporate Sponsors that are searching for women-owned business as suppliers and partners. The event offers panel matchmaker sessions, a keynote speaker, spend awards along with a silent auction, games and as always, networking! It is open to the public, even if you’re not certified or even a woman-owned business, you’re welcome and encouraged to attend. 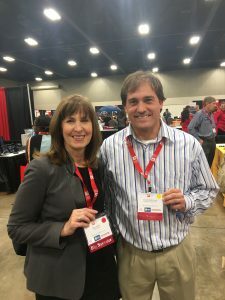 Jennifer Blakeney and Vinnie Kiedrowski of Guaranteed Express both found their match while playing the Match Game. Sadly, neither won the prize but had a great time looking for their match throughout the day’s event. This entry was posted on Tuesday, October 3rd, 2017 at 8:32 pm	and is filed under Blog, News&Updates. You can follow any responses to this entry through the RSS 2.0 feed. You can leave a response, or trackback from your own site.